The next big show in the Android arena is of course the much talked about Samsung Nexus Prime, the smartphone that is expected to come out to play packing Android Ice Cream Sandwich, and up until now we haven’t really had many decent sightings of the Nexus Prime, but now the device had apparently made its first appearance on video. And naturally we have that video footage for your viewing pleasure below courtesy of the guys over at Slash Gear and by way of Mibillissimo, which claims to be a hands-on with the Samsung Nexus Prime lasting just on a minute and a half. Unfortunately the footage doesn’t come with commentary, but then who needs commentary when you can get a visual of the next Android big boy, that should be a match for Apple’s newly released iPhone 4S. 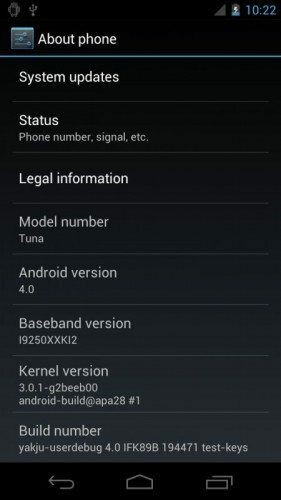 A screenshot that is claimed to be from the Samsung Nexus Prime, also know as the Samsung Galaxy Nexus (below) shows that Android Ice Cream Sandwich is indeed Android 4.0, although as for specifications on the handset things are still somewhat sketchy. Reportedly the Nexus Prime should come with a 1.2GHz processor, but there is a possibility it will have a 1.5GHz processor, while there have been rumours that the device will sport an 8 megapixel camera, but the other reports seems to claim that the Prime will sport a 5 megapixel snapper. However, as far as I am aware, this is the first time the Samsung Nexus Prime has made it to video, so I’ll stop babbling on and simply let you head on down to hit that play button and check out the Samsung Nexus Prime footage, and feel free to let us know your thoughts on the device shown by posting to our comments area below…enjoy.